Meet outside McDonald’s in Leytonstone High Street E11 for 10am departure. If you have questions, call Dwight on 07973 131429. Meet outside The Mill in Coppermill Lane at 11am. Return c. 3pm. If you have questions, email “Art Catcher” Katja. A relaxed and enjoyable afternoon travelling by bicycle and exploring the nooks and crannies in and around our borough. Frisbees sometimes materialise when we hit a suitable open space. We aim to stop off at a café at about half time, but we recommend you bring a snack and some water. Meet at 1pm at the Orford Road/Church Lane junction, E17 9RW, next to the old postbox opposite the Ancient House … see the map. 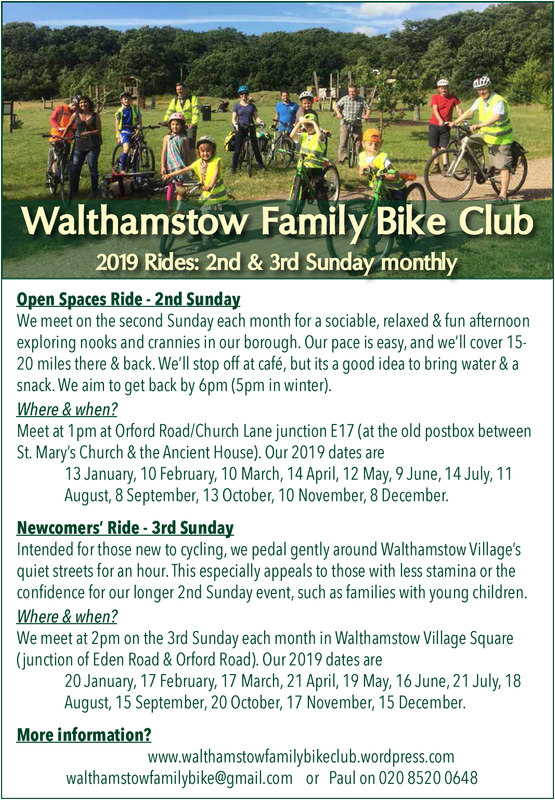 This ride around the quiet streets in Walthamstow Village is intended for those new to cycling, including families with young children, and will especially appeal to those who don’t have the stamina or confidence for our longer ‘Open Spaces’ excursions on the 2nd Sunday each month. Basic skills are necessary: please make sure you are able to pedal and balance, turn corners, and brake to a halt .. all without falling off! If you are not confident about your basic skills, then we can recommend the council’s free cycle training. We’ll keep together as a group and ‘top and tail’ the ride with marshalls, with an experienced ride leader at the front, and an expert marshall at the back to keep cars out of our convoy. We also have at least one other marshall who cycles on the right hand side of the group to help out with junctions etc. We meet at 2pm in Walthamstow Village Square at the junction of Eden Road and Orford Road (for a map click here). We finish at the Square around 3:30pm. Meet at the cafe, bring Oyster Card/contactless. Our monthly gentle-paced social ride, never more than 30 miles. Bring drink, but we will stop for lunch along the way. Please bring your Oyster card or contactless debit card in case we take public transport. Meet at 10:15 outside Walthamstow Library, for a departure by 10:30. We are usually back by 3-4pm. Whether you want to try road cycling and don’t know how fit you are, or you’re ready for a medium-paced effort, join the club. Medium-paced rides c. 50 miles. Meet outside McDonald’s in High Road Leytonstone. Back in time for lunch, or a pint at the North Star! North Star Velo also run frequent midweek short road rides, evening and sometimes morning so do check their website! If you would like your ride listed here just get in touch. Want to try family bikes and trikes? Rent one for the ride directly from Waltham Forest Council. This entry was posted in monthly ride list, Rides and Events. Bookmark the permalink.